You know, we've had a lot of fun with the carebears over the last year. Bumping them, exploding them, harvesting their tears... All of these are good things. But is it possible that the carebears have something more to offer us? Do the carebears actually possess a wisdom that we've failed to take full advantage of? I recently received an EVEmail from a carebear spokesman who suggested that very thing. Elgin Dranog articulated a fascinating perspective that I hadn't yet explored. Maybe I was wrong to add meaning to my life by "creating this weird community". If I just stopped for a minute and really listened to the carebears, I could find avenues for self-improvement. 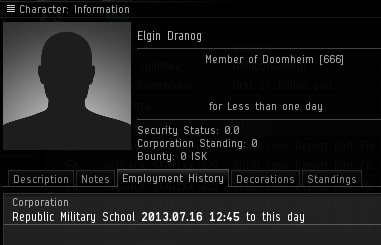 I looked Elgin up and discovered that he was a day-old alt creating solely for the purpose of sending me that EVEmail anonymously. But I couldn't shake the feeling that maybe the carebears were trying to help me with some constructive advice all along. There's only one way to know for sure, so let's find out! At first glance, Taly Zora appeared like every other incomprehensible, foaming-at-the-mouth angry carebear. But in light of Elgin's EVEmail, I noticed that she wanted me to "listen" to her. Was she attempting to communicate? I needed to study more EVEmails from more carebears. Nitr Sabezan spared a few words about my blessed mother, may she rest in peace. There didn't seem to be as much value in the EVEmail as Elgin would have me believe. Then again, not every painting is going to be the Mona Lisa. Countess Ambrosia was angry about being bumped, and made dreadful accusations about my motives. But she did say "be well". Perhaps she had my best interests at heart after all. The next EVEmail claimed I "clearly" wanted cash without doing any work. Not so "clear"; it takes a lot of work to keep the world spinning. Having read several EVEmails, I was disappointed by the lack of hidden wisdom. I decided I would need to expand my search and draw upon EVEmails sent to my fellow Agents. Once again, I detected glimmers of what Elgin was talking about: Infuriated by the loss of his ship, Devestation Tauriskus demanded that Agent Guybertini "do something constructive" in his life. However, the advice offered in the EVEmail simply reinforced the impression that many carebears have an oral fixation. Onward! Iam Salty offered a warning. As usual, it didn't amount to anything, since nobody's corp tried to attack me. More oral references and mother references. If the carebears were trying to communicate, it was in a very primitive form. There was just enough consistency to hint at a shared culture for the carebears--possibly even a dialect. The second bioreactor kendons EVEmail urged Guybertini to "talk to me straight up". Was this a request for the Agent to respond in the same dialect? Although I embarked on this study in the hopes of finding ways to improve my own life, the more carebear tears I read, the more I found myself concerned about the state of their lives. It was painfully evident that they didn't have the advantage of healthy, nuturing environments. Regardless of whether genetics played a role, the carebears simply didn't have the skills necessary to adapt to and function within a modern society. Experiencing failure after failure, they gave up and fell victim to an AFK lifestyle that further atrophied what few resources they did have at their disposal. All of this made me reflect on my own privileges. We of the New Order have so much going for us. This power implies a responsibility, doesn't it? I urge my fellow true EVE players to take up the burden of the Code, go forth into the wilds of highsec, and bring the blessings of civilization to these sullen, angry carebears! They may not show you any gratitude, but at least you'll have the satisfaction of knowing that you left them better than you found them. Great post, interesting philosophical analysis. I've always wondered why carebears tell honorable Knights to get a life, when theirs seems to consist of pressing F1, going to make a sandwich & surfing netflix. Carebears will thank you James, one day. And those who won't...well, the laws of nature are not as merciful as yours. Advise from high sec miners that doesn't include killing yourself in R/L? what up with that? I expect soon to have them spamming my 'removal of the one-man corp anti-wardec exploit and wardec dodging in general' thread in the ideas section of the forums, complaining that I am a James alt or I am a secret nazi or some other bunch of crap. High sec miners are so rude and so lazy. We in my corp would absolutely LOVE to have them visit our wormhole. We rarely get victi-...I mean visitors to...play with (by play, read viciously warp scram, ransom upon threat of podding then shoot them after they pay anyway). Hopefully next in line will be their request to remove CONCORD because they defend criminal bumpers! Yeah, that won't happen. To be honest, I am unsure that my thread will have any effect but I am willing to try anyway. As Bing Bangboom says, High secs worth fighting for. Nice :) , but I prefer to stick with classics, I'm old school. As unfortunate it as it is. The carebear menace is a reflection of the majority of society, EVE should be a sanctuary not an asylum that rewards those that are obsessed with projecting their insecurities onto others! "You're family member and/or guardian does this!" Groundless, weightless comments nothing short of ignorance born out of fear in an effort to keep themselves imprisoned in a cage constructed of gross-negligence, excuses of why they can't be successful and happy. In order for the carebear menace to be a rational, sensible entity that is to be respected. They NEED to develop to a point where they are capable of rational, coherent thought and communication. "All men are created equal". We're all equal yes? Then WHY do they continue to pretend they are NOT equal by perpetrating a false image of an unintelligent individual!? 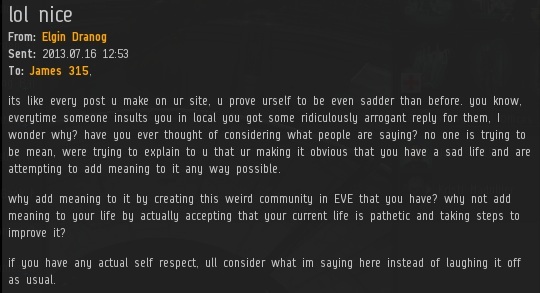 "why add meaning to it by creating this weird community in EVE that you have?". In his frantic and desperate rush to express incoherent thought patterns that he's not even stopped to analyse. His sentences appear as if they've been thrown together due to fear of being caught in a fire that is consuming the premises from where he is playing EVE. Just from analysing the writing style we can see, that this is definitely the case. When we disregard our Ego and look upon the information for what it is, we see a cry for help. I, Mitsushige will answer his cry for help! The New Order will eternally stand strong in the face of the frantic enemy before us! I end my message with what I believe to be most important facts. The New Order WILL stand firm and save the carebears from themselves! Also, "YOUR family member", not "You're family member". I sincerely apologise to the both of you. I address "Agent Ramble-On-Much?". I apologise you found it to long to read. To the second individual that chose to remain Anonymous, I apologise for the incorrect use of "You're". My attention to detail here was lacking as I was quite tired, It is most unfortunate as I do realise how easy it is to see the wrong use of a word and jump at the false opportunity where one believes he can make someone feel bad and himself good. If I may, for the both of you I have a question. Would you deem my words to long to read if I posted them on the official EVE forums? I think quite possibly, you both may be being more defensive than you should be. You may find a place in the loving and supportive family that is New Order! I sign of by wishing both of you a most excellent Thursday! Your insightful words and the dedication of yourself and other agents give me renewed hope that highsec may one day again be a place of joy, happiness, and kindness. I cannot say that I speak for the whole of the EVE community, but your actions and those of the whole Order are appreciated by at least one pilot. SO, I'm mostly a Carebear and I actually love your blog...most of these idiots are either fail fit, don't pay attention to Dscan/local or don't understand game mechanics. This site makes me chuckle over the amount of tears that they cry. I would give you my name by signing in but somehow I would find locator agents tracking me down to be bumped and attempted ganks. Your tears are precious to us. Every "ha" is one tear.